The attorney general’s comments during a “Fox & Friends” interview were his most expansive to date on the Justice Department’s appointment last month of Mueller to run the investigation. “Mr. Mueller is someone I’ve known for a long time, and I’ve had confidence in him over the years,” said Sessions, an Alabama Republican who served for years on the Senate Judiciary Committee, the congressional panel that oversees the FBI. Republicans have also raised conflict-of-interest concerns by noting that some lawyers on Mueller’s investigative team have previously contributed to Democratic candidates, though federal law and department policy does not permit the special counsel to take into consideration the political affiliations of a potential hire. 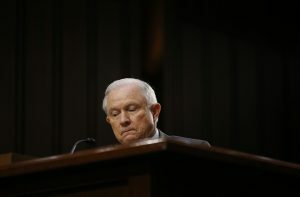 Still, Sessions said he was hopeful the investigation would conclude sooner than later, a point White House staff has repeatedly made, and he did suggest that questions about the composition of Mueller’s staff could be fair game. Mueller was appointed FBI director by Republican President George W. Bush and held the position for 12 years. Left: U.S. Attorney General Jeff Sessions said he hoped the Russia probe could "move forward and come to an end sooner rather than later." Photo by REUTERS/Jonathan Ernst.